Our range of products include fly ash bricks making plant and automatic fly ash bricks making machine. Brand Q GREEN TECHCON PVT LTD.
QGH - 14 machine is the most recommended product and a True Business Builder for the Buyer. The Machine comes with all Branded Parts , Upgraded PLC Control Panel which enables smooth functioning . Box Feeder provides additional storage ,proper input - output ration of raw materials which insure the actual production . ** Production capacity mentioned is a rated capacity and it depends upon experience of work force, efficient team & effective time management. 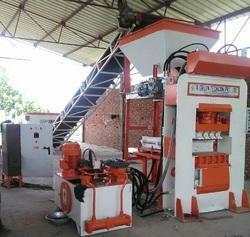 Heavy duty Fly Ash Bricks Making Automatic Machine, capable of manufacturing 10000 bricks per shift of 8 hours.